At 30, you learn about things you didn�t know when you were 20. When you�re 40, life looks different again. If you live 100 years, what would life look like to us? If we had that knowledge beforehand, wouldn�t our life become a bit more fragrant? 97-year-old Professor Kim Hyung Suk is an intellectual that awakens us through philosophical reason that looks through life. He tells the secrets he�s learned as he lived his own life to the younger generation who are uncertain and floundering in the 100-years-generation. And he tells us that his happiest times were when he had love through hardships, and that it took him over 90 years to understand. 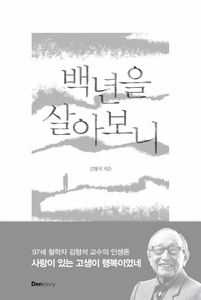 Kim Hyungseok is the author of the best-selling book (영혼과 사랑의 대화) (Conversation Between Eternity and Love). Although he is 97 years old, his mind is still sharp and he continues to influence the younger generations by sharing lessons he has learned from experience. From problems arising from familial relationships, the meaning of life and death, and daily struggles, he covers it all.